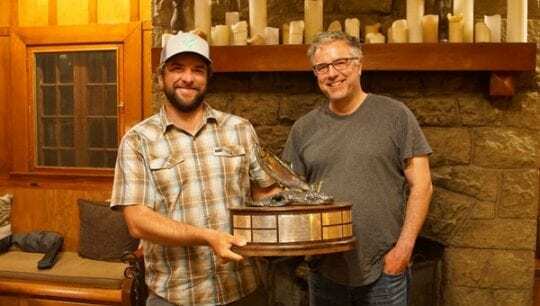 Over 3,000 Inches of Wild Trout Caught in Five Rivers Challenge | California Trout, Inc.
After a 15 year hiatus, the Five Rivers Challenge returned August 24-28, 2016 on the wild trout rivers between Mt. Lassen and Mt. Shasta in the Burney area of northeastern California. Six two-person teams caught and released an amazing 3,090 inches of wild fish over three days of fishing on five rivers. The event was hosted by Clearwater Lodge and was held on five of the best blue ribbon trout waters in the country —the Upper Sac, McCloud, the Pit, Fall River and Hat Creek—iconic places sharing a common attribute: cold, clean spring water. The challenge was as much a friendly competition as it was a celebration of the health of these rivers and their wild trout populations. Teams competed to see who could catch and release the most fish inches across all five waters over three days. First place went to Steve McCanne and Alec Gerbec guided by John Fochetti, coming in with 1,088 inches of wild trout. The team established a solid lead after Day 1 on the McCloud and Upper Sac and never looked back. McCanne and Gerbec will have their names engraved on the bronze Five Rivers Challenge perpetual trophy that will be housed at the Clearwater Lodge. They also received prizes from sponsors Sage and Rio. Coming in second was Steve Johnson and Armando Quintero guided by Jason Cockrum with 547 inches. Johnson and Quintero received prizes from sponsor Redington and Rio. Rounding it out in third was Mike Moran and Ben Paul guided by Dave Neal with 414 inches. They each received a canvas print by Josh Udsen. A total of 863 wild trout were caught and released across the five rivers with the largest being a 19 inch rainbow caught on the Fall River. The Pit River was the most prolific 801 inches of wild trout while the Fall was not, offering only 273 inches. The Challenge was sponsored by Clearwater Lodge and Patagonia with prizes from Sage, Redington, and Rio. The dates for the 2017 Five Rivers Challenge have been set for the third week of June. 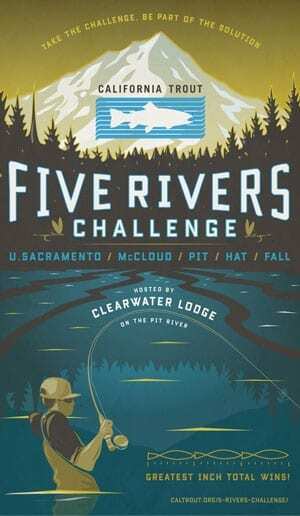 For more on the 2016 Challenge and to sign up to receive information on the 2017 Challenge when released, visit caltrout.org/5-rivers-challenge.